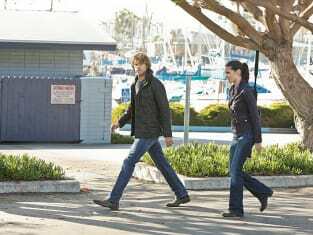 If you were hoping for a hug, a smooch or something more between Deeks and Kensi, you were likely left disappointed at the end of NCIS: Los Angeles Season 5 Episode 21. If you wanted the partners to honor their agreement to be patient and take things slow, then you were probably left satisfied. There definitely weren't any fireworks; instead it was a slow burning fire between the two. They are both the masters of subtlety. NCIS: Los Angeles Photos from "Three Hearts"
Immediately after "Three Hearts" ended, I wasn't sure how to read the final interactions between Kensi and Deeks. He wanted to talk and she ... didn't? After some consideration, I decided what happened was quite beautiful and demonstrated the special and unique language the two of them speak with each other. Hetty was up to her games again by having the two of them interrogate Agent Angelo. I didn't like him one bit. He was smarmy and full of himself. He may have been able to read them well, but they didn't let him get the best of them. They maintained control of the room for the most part. In the end, Angelo was a compromised agent. When he was given the opportunity to help Olivia to turn on her husband, Angelo used it to warn her instead. That was a choice that cost several men their lives, landed Olivia in prison, and caused Angelo to lose his true identity. He paid a hefty price for his misplaced loyalty. Hetty let him go to suffer as Angelo, but warned him she would call on him in the future. I hope she doesn't. I don't want to see him ever again, though her threat was an added torture for him to suffer. After finishing the case, Kensi and Deeks talked. I find it a bit odd that they haven't hung out at all since they returned from Afghanistan. They used to be friends and go out for dinner and hang out all them time. Now, there's a weird awkwardness between them. I really want them to get over that and quick. Angelo's story of the three hearts, provided the lead-in that Kensi needed. She asked him, "What's your third heart tell you?" And, he responded by giving back her father's knife. At first thought, I took it as him giving back a class ring. He was ending it with her, but then it took on a different meaning. He wants to believe raccoons mate for life after all. He gave her the knife back because he didn't need it any more. It was a reminder of her while she was gone and now she's back. He has her and he doesn't need to keep her proxy. In response, Kensi used the knife to open the box that he's been curious about all this time. The box has taken on the representation of their relationship. It's been boxed up. She cut it open. Instead of ending their relationship, they moved it forward to the next level. It got even better when the contents were revealed. Kensi, she's a smart one. Deeks pulled out the contents and it was another sealed box. "Touche." Too bad he doesn't have knife to open it! It was poetic, but wouldn't you just rather have them go out for a drink? Maybe next week! Even Hetty realizes they have taken a step forward, even if Granger can't see it. It's definitely "The end of the beginning." Were you happy with the box reveal and all that went with it?